Zhang Jike's fan club has decided to celebrate their hero’s birthday with a unique gift. The 16th of February will mark Zhang Jike’s 29th birthday. You could say that being a Olympic gold medallist and World Champion, he has nearly everything he ever wanted. So what do you get someone with career Grand Slam for their birthday? Members of the ZJK Fan Club have pooled their resources together and will celebrate the occasion by running advertisements of their hero on two buses. While this might not be everyone’s definition of a ‘party bus’, the fans have certainly come up with a one of a kind present. The advertisements will run for one month from the 23rd of January across Qingdao, Jike’s birthplace, and Beijing, the city where he grew up. The No. 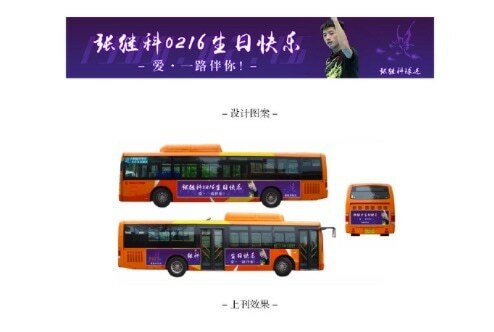 216 bus is a small nod to Zhang Jike’s birthday; February 16. And how about that Beijing bus? Well that is important piece of table tennis trivia. From first to last title, 445 days is the time it took Jike to achieve his Grand Slam; the fastest in the history of the sport. 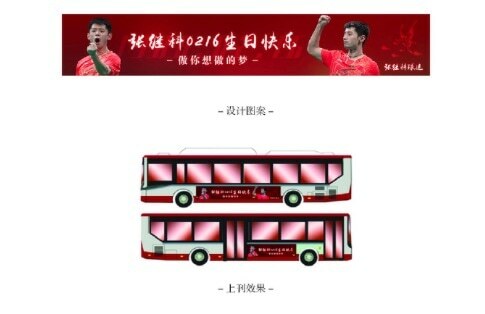 So if you’re passing through Qingdao or Beijing over the next month, why not take the time to buy a ticket to ride on one of Zhang Jike’s birthday buses.